It’s the distant future and the world seems to be quieting after the tumultuous Twilight Century that followed the end of the oil age. Still, it’s a difficult time. New Qian has taken over the Scandinavian Union. Water is scarce, so people survive on monthly water rations. Noria Kaitio lives with her parents. Her mother is a scholar, but her father raised her to follow in his footsteps, so Noria trains every day to become a tea master like him. For the most part, her family follows the old traditions. However, her ancestors have also kept a dangerous secret: they know the location of a spring that still gives clean water. Now, it seems, the military has begun to suspect their secret. Commander Taro visits their backwater village to try Master Kaitio’s tea. When he remarks on the clarity of the water and of the tea, he is offering both a compliment and a threat. Soon, Taro’s troops are searching Noria’s house and her mother leaves the family to form a new life in the distant East. Though she has the chance to join her mother in a safe exile, Noria instead chooses to preserve her family’s traditions — and she tries to protect its secrets. She tried all three TDKs several times, spinning the tapes back and forth and turning the TDKs from one side to the other, but all we heard were ghosts of sounds sunken in time and distance, a near-silence that was more frustrating than complete soundlessness. I sometimes felt that Itäranta was trying to take the minimalist approach that Julie Otsuka uses in When the Emperor Was Divine or that Ernest Hemingway uses in The Old Man and the Sea. Both authors have a knack for finding little details in the setting that allow the reader into the narrative. However, both Otsuka and Hemingway manage to establish a unique atmosphere while also creating engaging characters. Unfortunately, I rarely felt connected to Noria, and I often struggled to figure out what was at the heart of her personality. She does not rebel against very much, which suggests that she is calm and centered. However, she is also not juxtaposed against anyone who exhibits noticeably different traits. Noria seems more flat than grounded, so I also didn’t worry over her desire to become a tea master, her relationship with her parents or even the threat Commander Taro posed to her family’s traditions. The lyrical style that Itäranta adopts in these passages may be the greatest strength of Memory of Water, but I eventually reached a saturation point on the topic. And although the idea of a New Qian empire is intriguing, I didn’t feel like there were enough details in this world to justify investing myself in it, let alone exploring it through the many figurative meanings of water. All in all, Memory of Water struck me as a fine debut and a good, but not great, novel. In fairness, Memory of Water has won and been nominated for a variety of awards. And it’s worth noting that Itäranta’s prose, which often seeks to derive meaning from silences and absences, may go very deep for some readers. Unfortunately, I wasn’t able to draw much from it. Publication Date: June 10, 2014. An amazing, award-winning speculative fiction debut novel by a major new talent, in the vein of Ursula K. Le Guin. Global warming has changed the world’s geography and its politics. Wars are waged over water, and China rules Europe, including the Scandinavian Union, which is occupied by the power state of New Qian. In this far north place, seventeen-year-old Noria Kaitio is learning to become a tea master like her father, a position that holds great responsibility and great secrets. Tea masters alone know the location of hidden water sources, including the natural spring that Noria’s father tends, which once provided water for her whole village. But secrets do not stay hidden forever, and after her father’s death the army starts watching their town—and Noria. And as water becomes even scarcer, Noria must choose between safety and striking out, between knowledge and kinship. 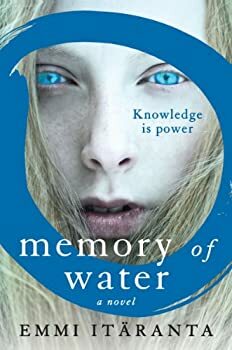 Imaginative and engaging, lyrical and poignant, Memory of Water is an indelible novel that portrays a future that is all too possible. It sounds like something I’d like. I love this idea, but I would expect the characterization to be more complex.